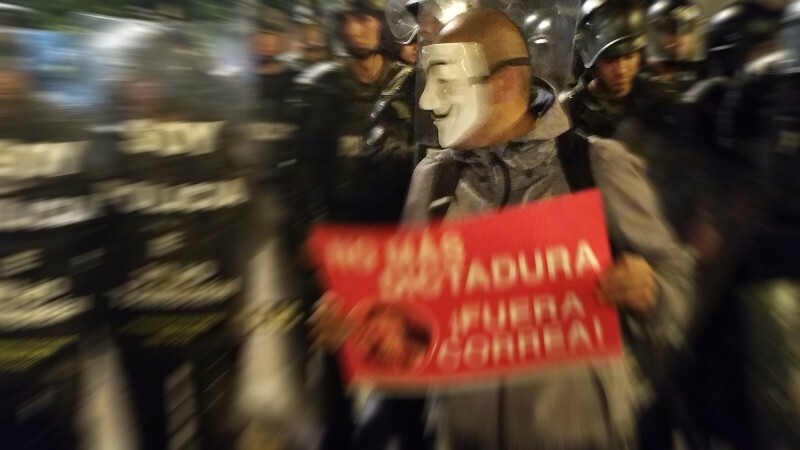 Image of demonstrations against the President of Ecuador, Rafael Correa. Photo: Alfredo Velazco. Earlier this month in Ecuador, protests broke out in various cities across the country. The protests stemmed from the government's proposal to implement new taxes on inheritance and capital gains, as well as a series of other economic measures to deal with low oil prices and the appreciation of the dollar. These protests, featuring high levels of civic participation, were assembled though the use of social networks, as 46 percent of Ecuador's 16 million residents have Internet access. 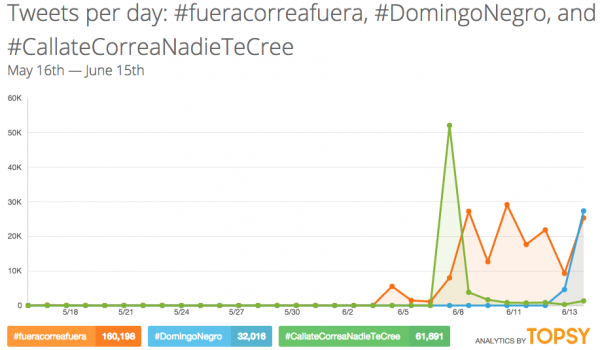 Twitter, with one million users in the country, is the network which sees the greatest amount of critical hashtag activity against President Rafael Correa. During the demonstrations, at least during those in Quito and Guayaquil, problems were evident with mobile Internet services supplied by private service providers. People noticed the problem and came up with explanations ranging from network saturation due to the massive volume of users, to the use of signal jammers, which are illegal under Ecuadorian law. Arcotel, the government agency responsible for overseeing telecommunications, has not commented on the communication breakdown. In the meantime, the use of peer-to-peer apps, like those used during the Hong Kong protests, is taking off. In the wake of the mobile Internet problems witnessed during the mass gatherings, opposition Senator Andres Paez called for the use of the FireChat app, a messaging service that is guaranteed to work during social protests, concerts or football games, and even natural disasters. During the protests, some media reported attacks of a different nature, from denial of service (DDoS) to the creation of fake accounts to distort information. In the afternoon of Wednesday 10 June 2015, a fake profile was set up on the social network Facebook. This profile uses the name, logo and images of EL COMERCIO, which is attacking our rights to freedom of expression and principally our right to protection of intellectual property. We reported this action, which coincided with the Twitter accounts of some of our collaborators being included on suspected “opposition journalist” lists. We ask our readers not to get caught off guard. 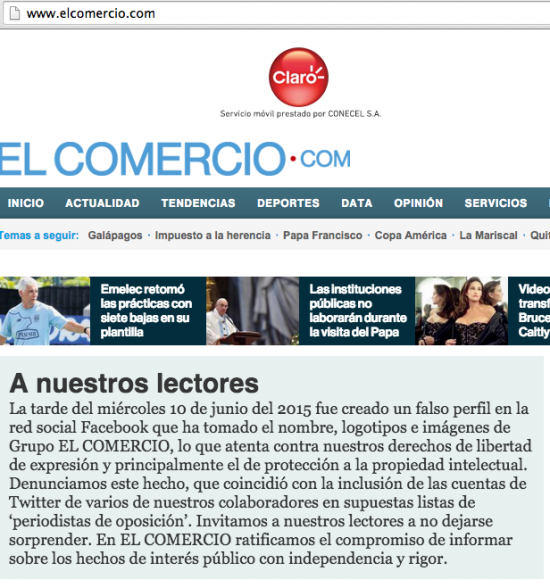 At EL COMERCIO we are committed to reporting on matters of public interest, independently and accurately. Actions affecting the mobile Internet services of people at protests and attacks on the media come amid government campaigns to publicly shame the opposition, and claims of “troll centres” to manipulate public opinion on social networks. Upon his return from a tour of Europe on June 15 and a few hours after speaking out against the protests, Correa announced that draft laws on inheritance and capital gains tax would be temporarily withheld, citing the need for peace in the buildup to the visit of Pope Francis to Ecuador July 5-8.